Leading the way in luxury and comfort, Concerto River Ships represent a revolution in ship design. 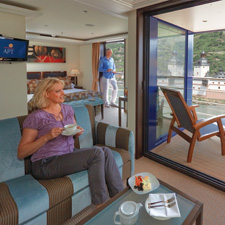 They are the grandest ships on Europe’s rivers and present a wealth of exclusive facilities and suites. Concerto River Ships are the only ships in Europe that present Twin Balcony Suites, featuring a large Outside Balcony and a Panoramic Balcony. The high staff-to-guest ratio onboard means you will experience incredible standards of service from APT. Twin Window Suites are among the largest entry-level suite categories on Europe's rivers. Featuring twin windows, they offer the comfort, size, amenities and sophistication of Panoramic Balcony Suites. Retreat to unimaginable luxury in your Owner’s Suite+. Measuring a huge 350 square feet, they present both a Panoramic Balcony and a large Outside Balcony. Panoramic Balcony Suites feature floor-to-ceiling glass doors that slide open. This transforms your indoor seating area into an enclosed balcony, offering fresh air and unimpeded views of Europe’s waterways. These suites are the perfect choice for those seeking the next level in cruising style and elegance, with two private balconies; a Panoramic Balcony and an Outside Balcony. Twin Balcony Suites feature both a Panoramic Balcony and an Outside Balcony. With enhanced floor space, the style and design of these exclusive suites cannot be equaled.